The monument traditionally ascribed to Adam of Carmarthen, Abbot of the Cistercian abbey of Neath from c.1266-1289, lies in the ruins of his house, described by Leland in the 1530s as the fairest in all Wales. 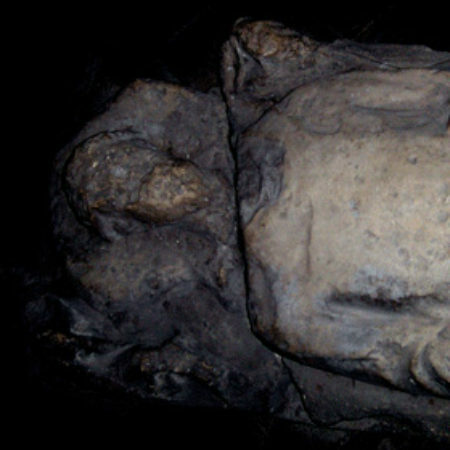 It is a badly damaged monument, broken into three at the neck and knees, and worn by many years’ exposure to the weather in a nearby field, although currently housed in the undercroft. 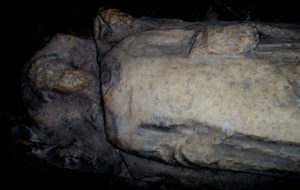 It is a large, high relief, recumbent figure, probably carved in Dundry stone imported from the Bristol region. The head of the figure is bare and lies on a single diagonal cushion, flanked by what appear to be censing angels, now practically obliterated. The abbot holds his arms close to his sides. The right forearm has disappeared, but the left arm holds an oblong, gabled object, which has been interpreted as both an open book and as a church. Given that Abbot Adam initiated Neath’s splendid Decorated-style rebuilding in the late-thirteenth century, later so admired by Leland, the latter might seem the most likely option. The front of the torso is worn smooth but the drapery at the sides of the figure falls in flat, regular folds to the feet where it lies in ripples at the hem. The figure’s left foot is the only one remaining, and appears to be resting on the crouching figure of a monk, an unusual feature. Although now quite difficult to interpret and appreciate – stemming not just from the wear it has suffered, but also from the gloom of its current surroundings – it does not take much imagination to realise that this was once a finely-carved and imposing monument. Neath was one of the wealthiest religious houses in Wales, but the Cistercian order discouraged funerary ostentation and Abbot Adam’s memorial is not in the least reflective of the humility expected of the order. The cross-slab of Abbot Robert of Rievaulx, who died while visiting nearby Margam Abbey at the beginning of the fourteenth century, is far more fitting with Cistercian ideals, suggesting that the regard felt for Abbot Adam amongst his community must have been great indeed. It is not known when Abbot Adam’s monument was thrown out from the abbey into the nearby field, but presumably it was some time in the sixteenth or seventeenth century when the church buildings were allowed to fall into ruin. Similarly, the motivations behind the act are not easy to fathom: was it an act of iconoclasm, or an attempt to remove it from the attentions of vandals and thus protect it? The breaking off of the head and feet (which rest, it may be remembered, on the figure of a monk) although conceivably an act of iconoclasm, may also be explained as the action of freeze-thaw weathering while exposed to the elements. If iconoclasts were responsible for the damage it is strange that the broken-off portions were not discarded, yet they remained aligned with the rest of the body. The monument remained in the field until at least the latter part of the nineteenth century and was subsequently removed into the more protected position of the undercroft. This, unfortunately, was not the end of its travails, and a recent tormentor has appeared in the unexpected form of the BBC. Neath Abbey undercroft is now in demand as a set for episodes of the BBC Wales productions Dr Who and Merlin. 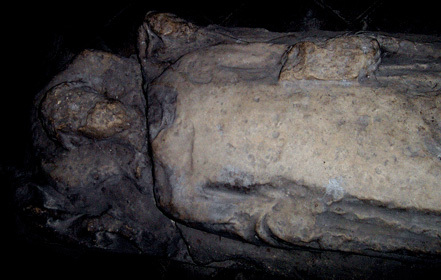 Lying in the centre of the undercroft, Abbot Adam was judged to be in the way and has been moved to the edge of the room along with other fragments of medieval sculpture which are kept there. In doing so he has been disarticulated so that the head and feet have been removed from the body and the integrity of the figure has been lost. It is sincerely to be hoped that the original position and condition of this beautiful example of medieval sculpture will be remembered and that it will be restored accordingly. Peter Lord, The Visual Culture of Wales: Medieval Vision (Cardiff, 2003), p. 333.